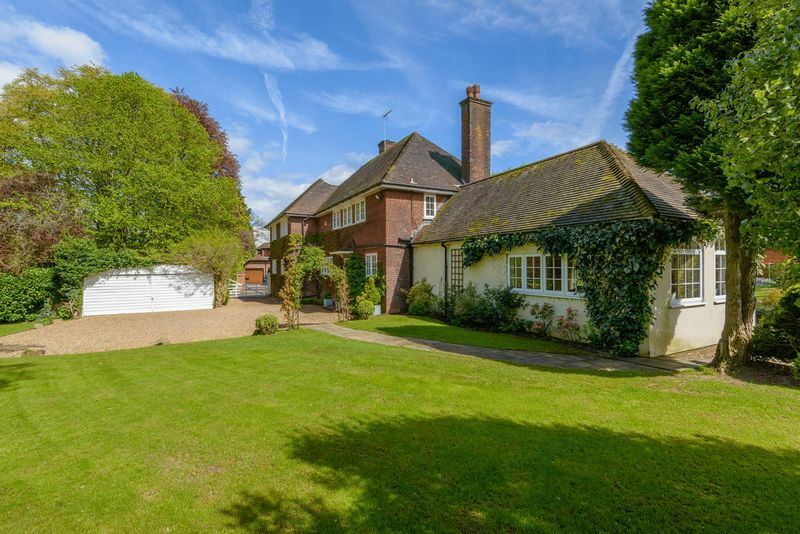 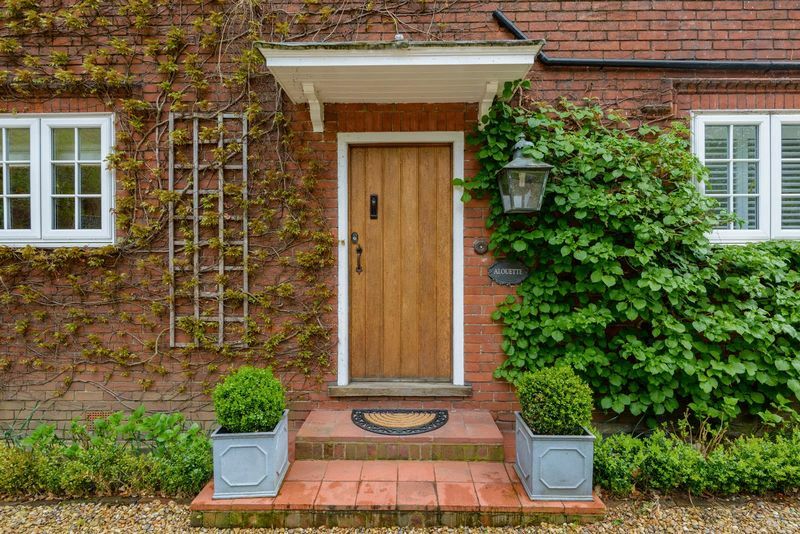 Superbly presented 1920's house situated in this prime Old Shenfield location, within a private turning convenient for both Shenfield Broadway with its mainline link to London Liverpool Street and forthcoming Crossrail hub to Heathrow and beyond. 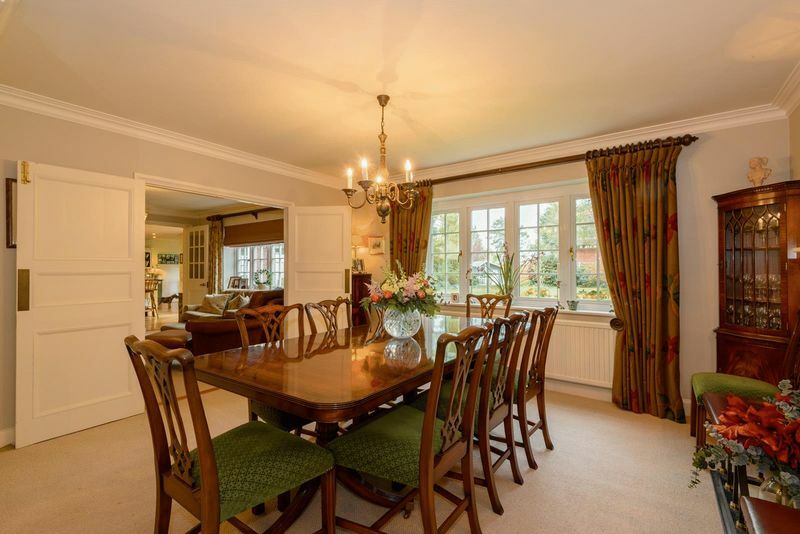 Brentwood School and town centre are nearby. 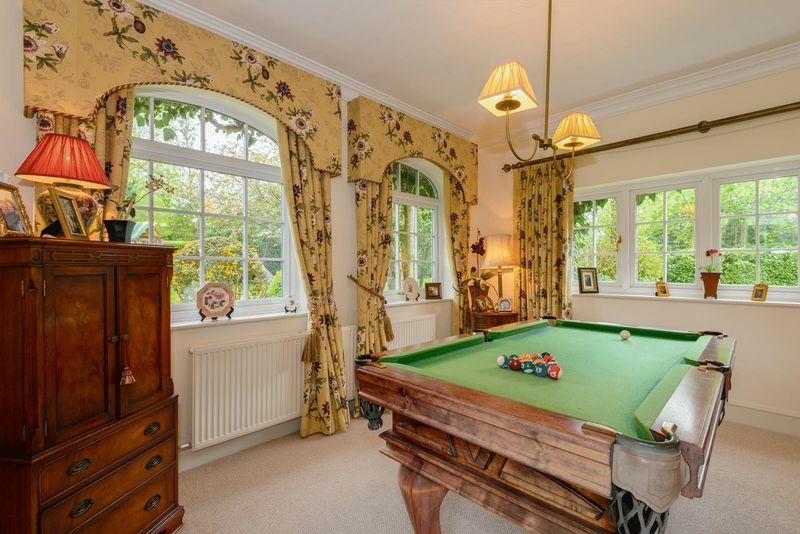 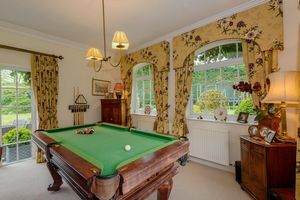 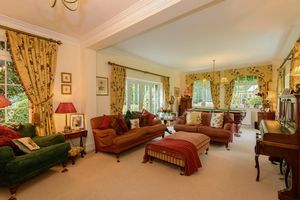 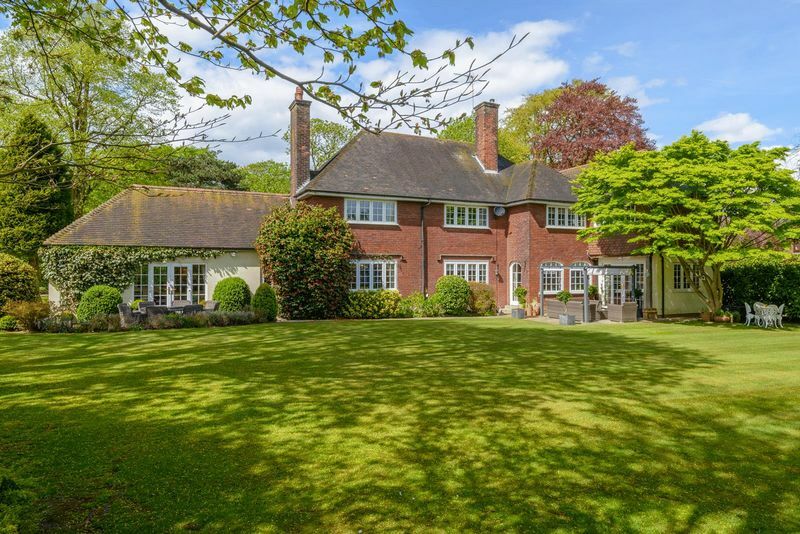 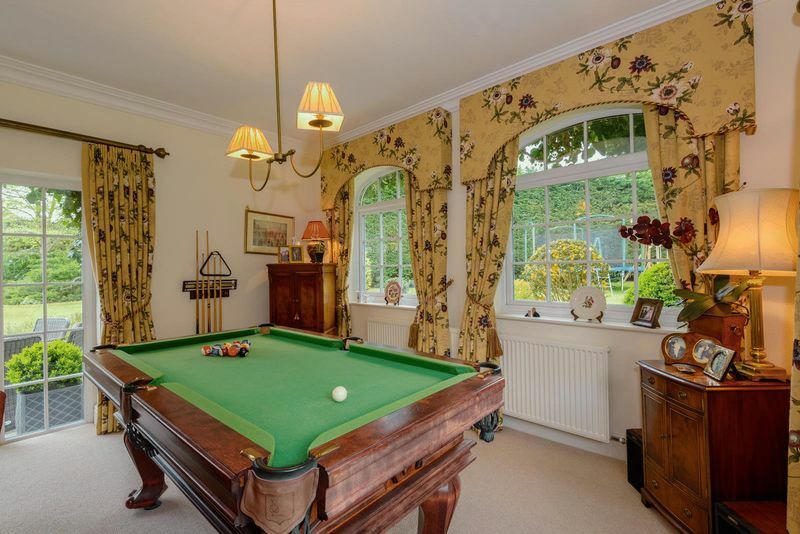 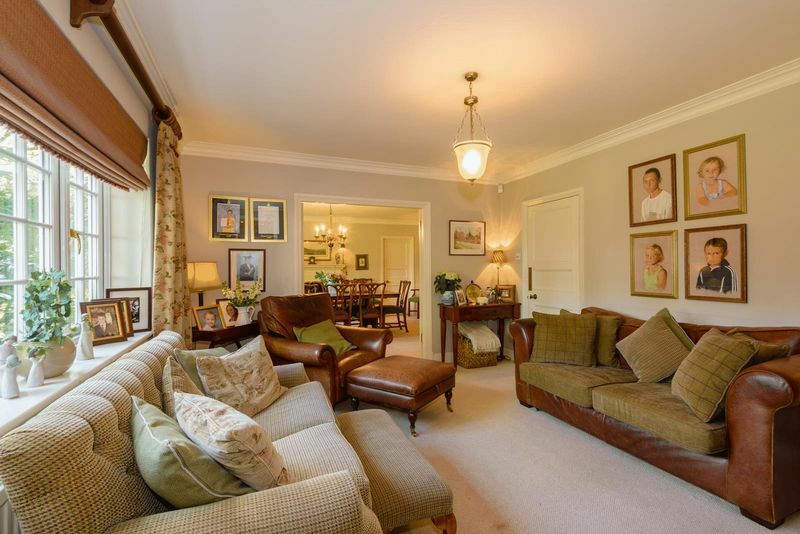 This spacious well appointed residence offers over 3000sq ft of accommodation which includes; formal drawing room, snug/family room, dining room and study. 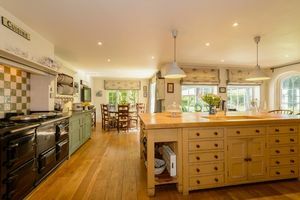 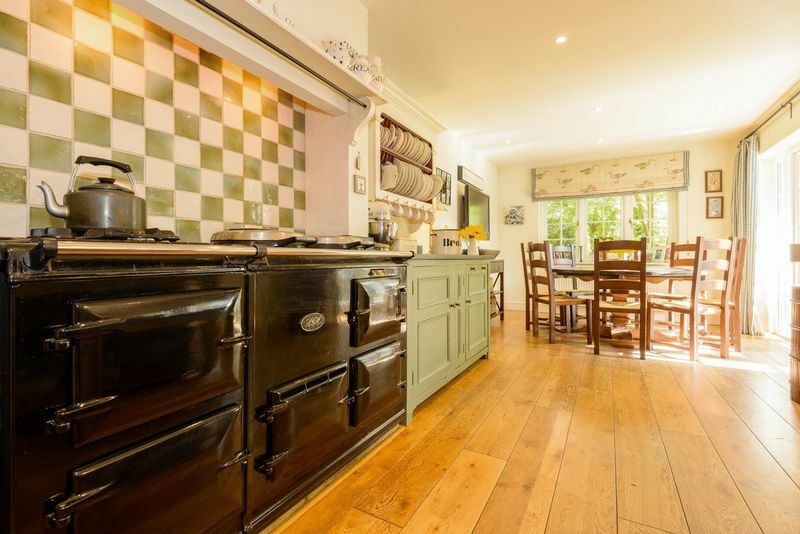 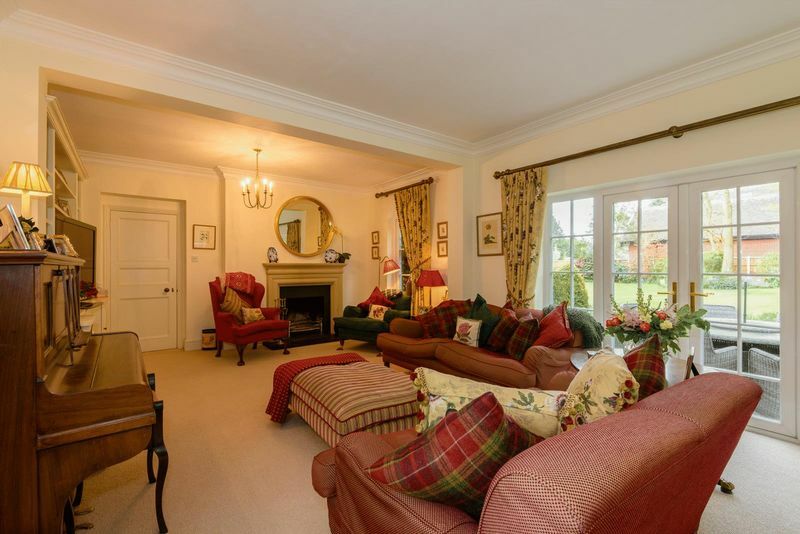 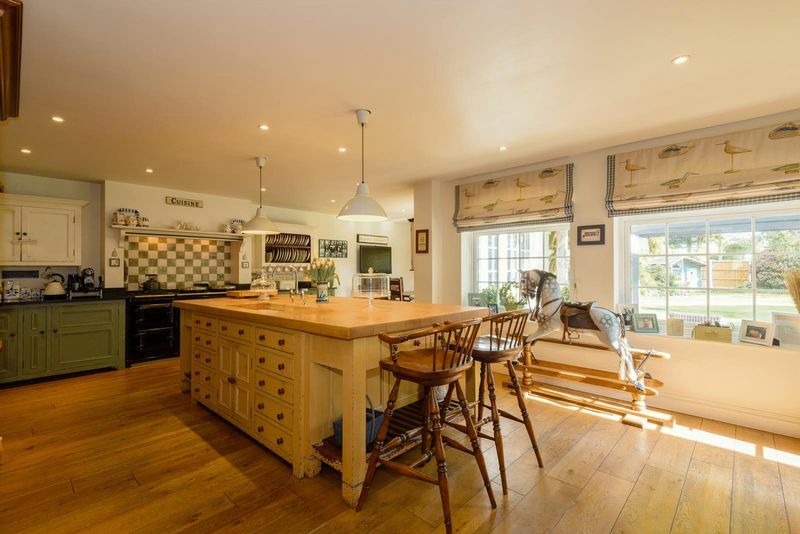 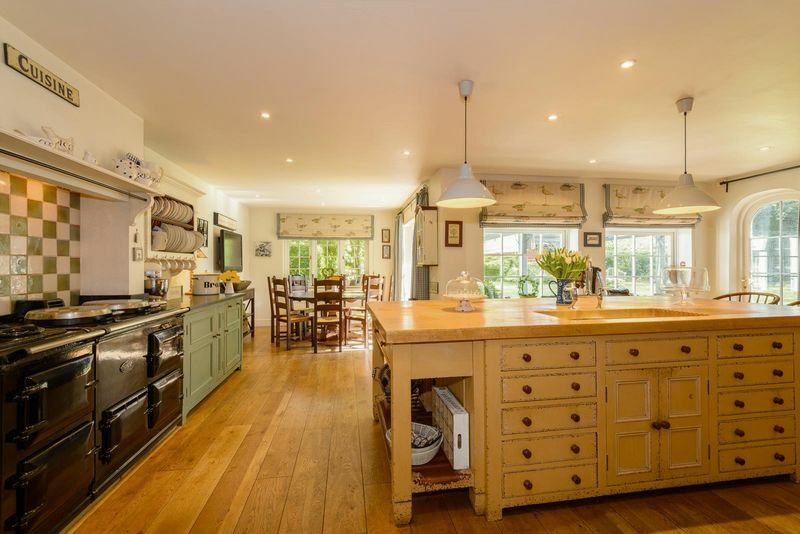 Stunning kitchen/breakfast room with walk in larder, utility and two cloakrooms. 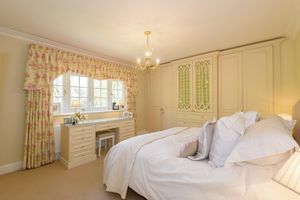 The first floor has a superb master bedroom suite including large luxurious bathroom and walk in dressing room, four further bedrooms, family bathroom and recently fitted luxurious shower room. 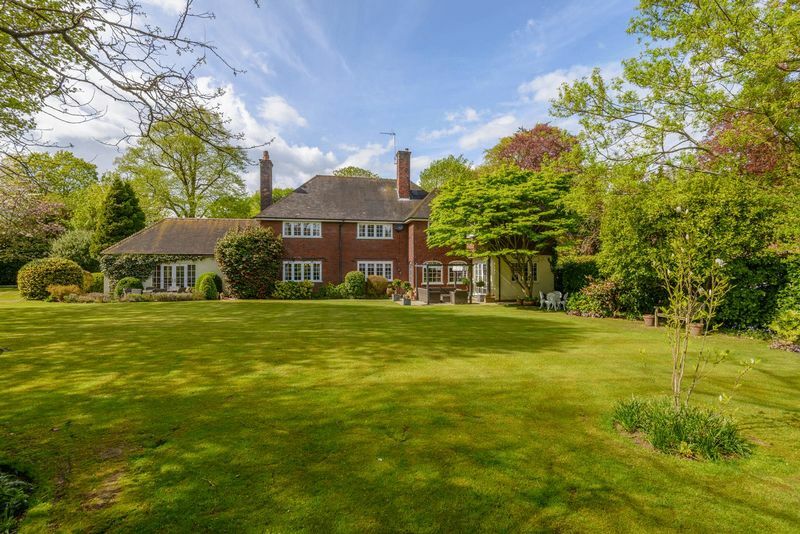 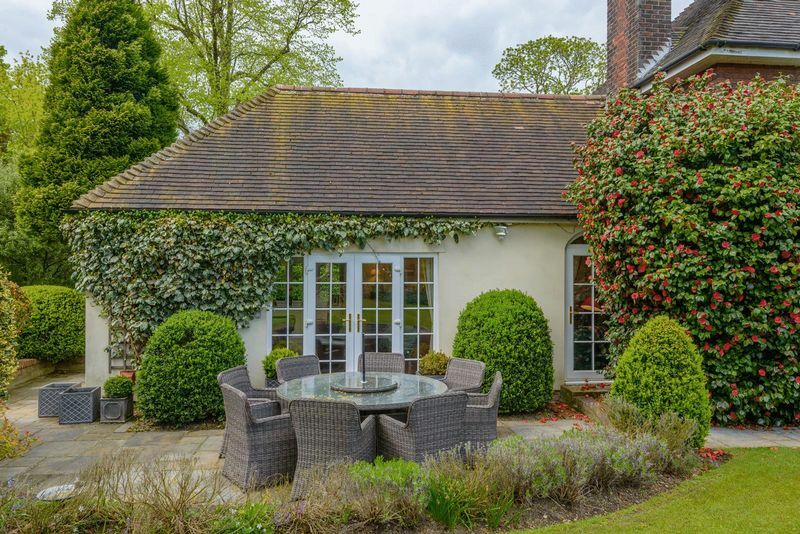 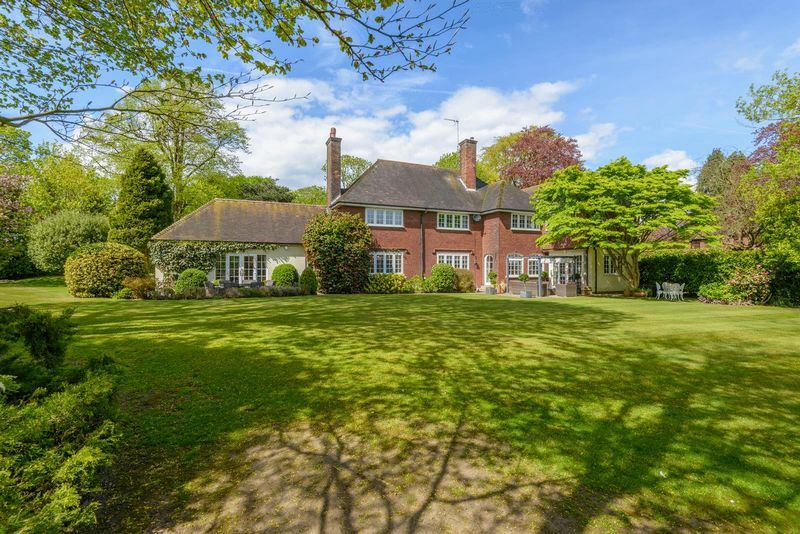 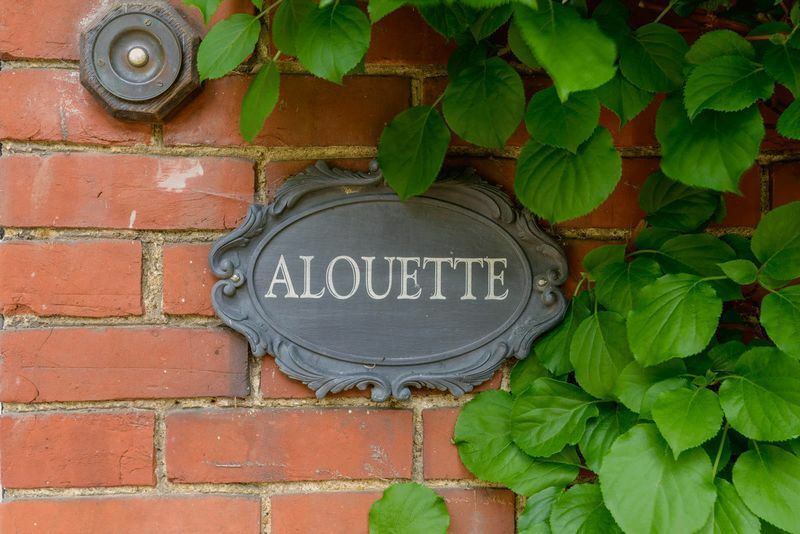 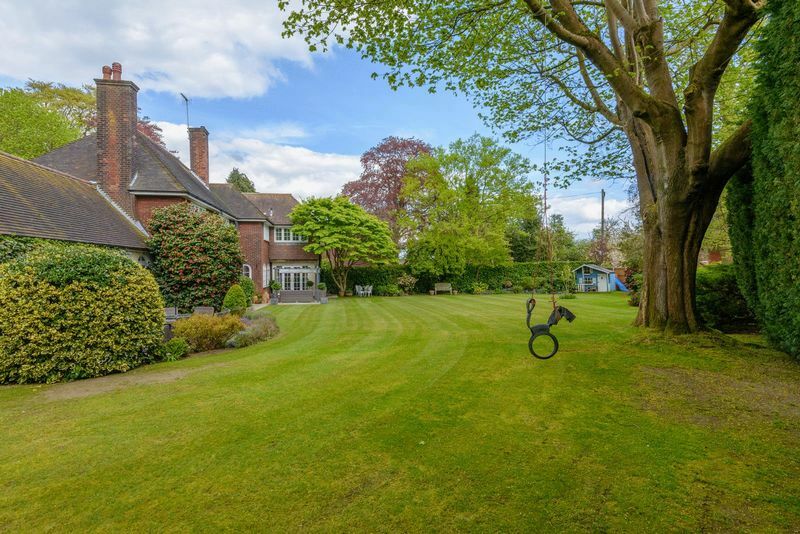 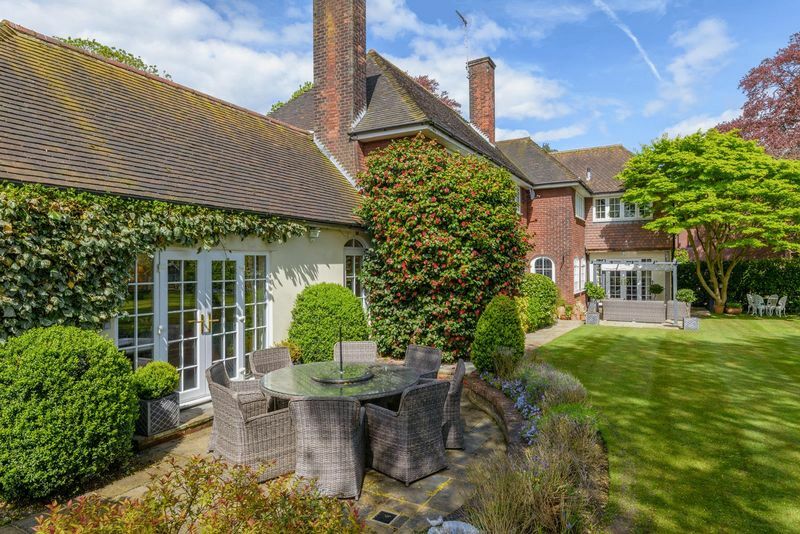 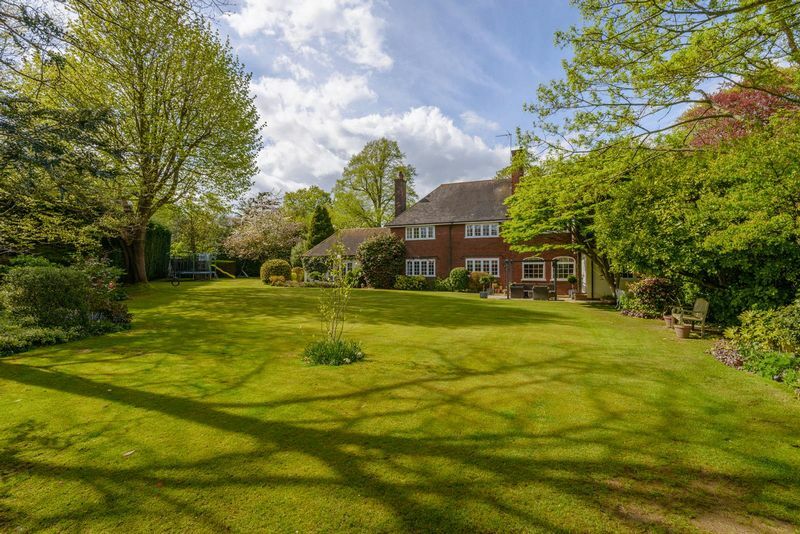 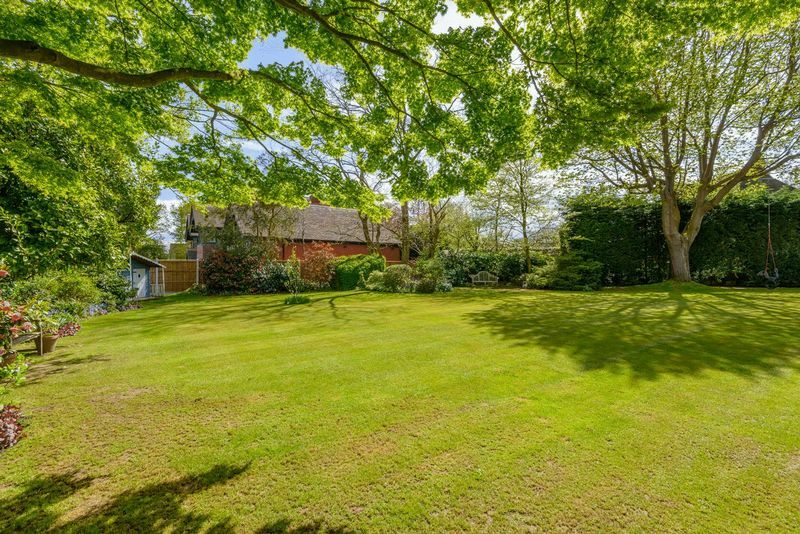 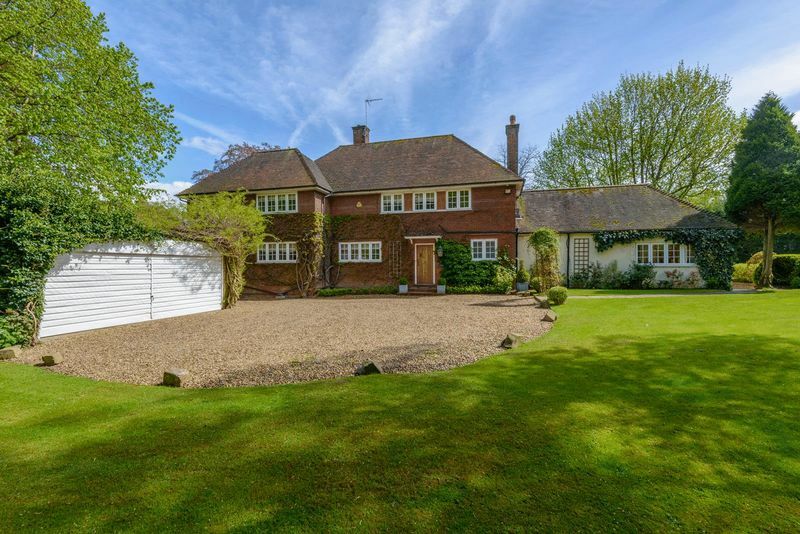 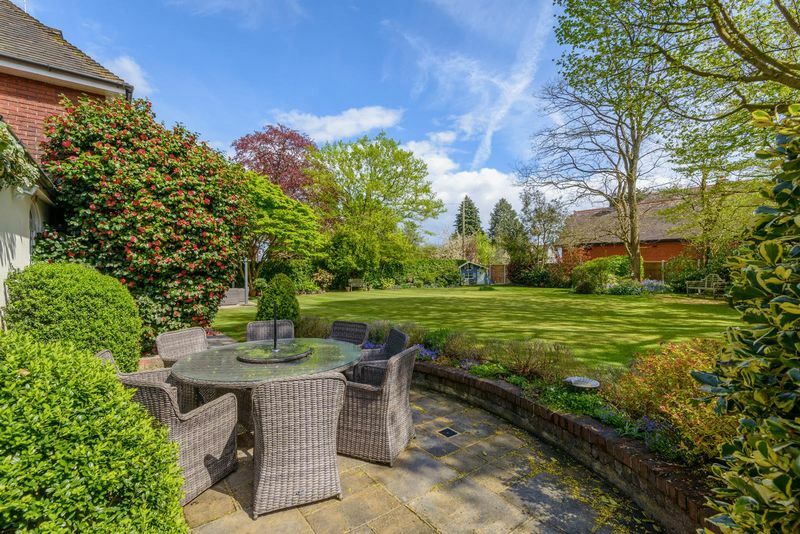 The shingle driveway provides parking for numerous cars and leads to the detached double garage and in turn to the charming south and west facing landscaped gardens which are within half an acre (stls). 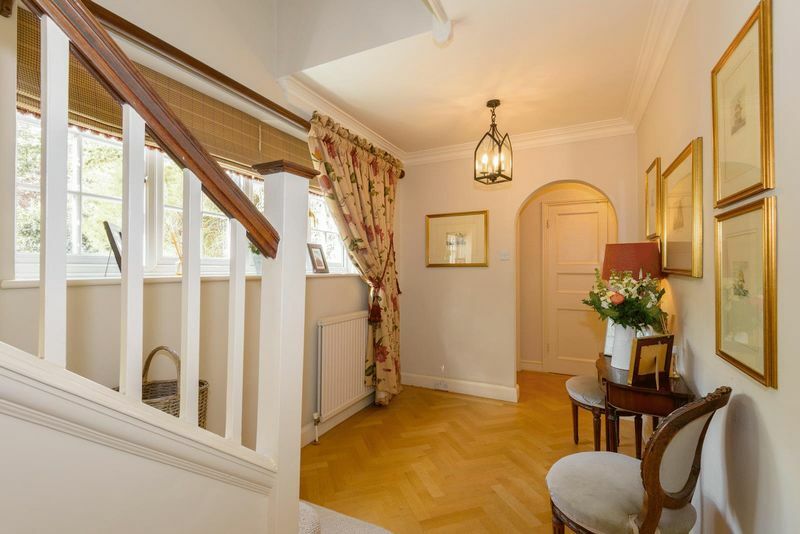 EPC E.
Measuring 23' in length, painted balustrade staircase with polished wood handrail leads to first floor with storage cupboard below. 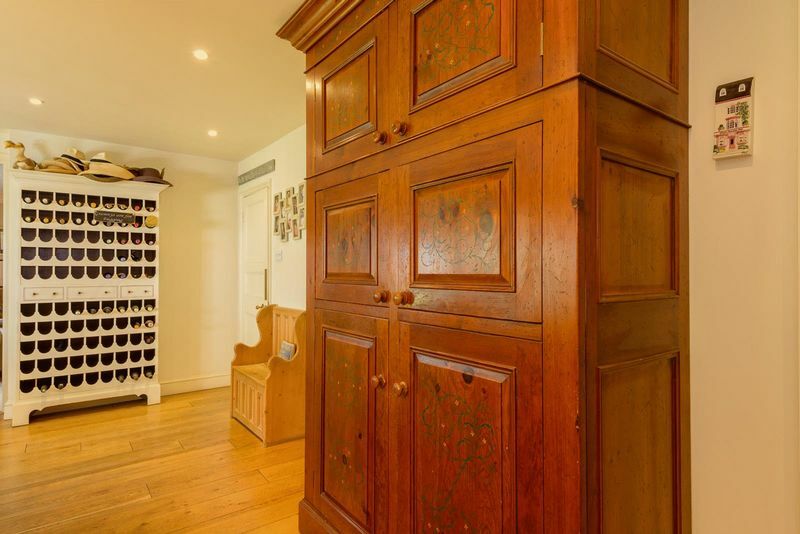 Oak herringbone style parquet flooring, two radiators, large coat cupboard, window to front. Suite comprising close coupled WC., pedestal wash hand basin, attractive half panelled walls, oak herringbone style parquet flooring, window to front. 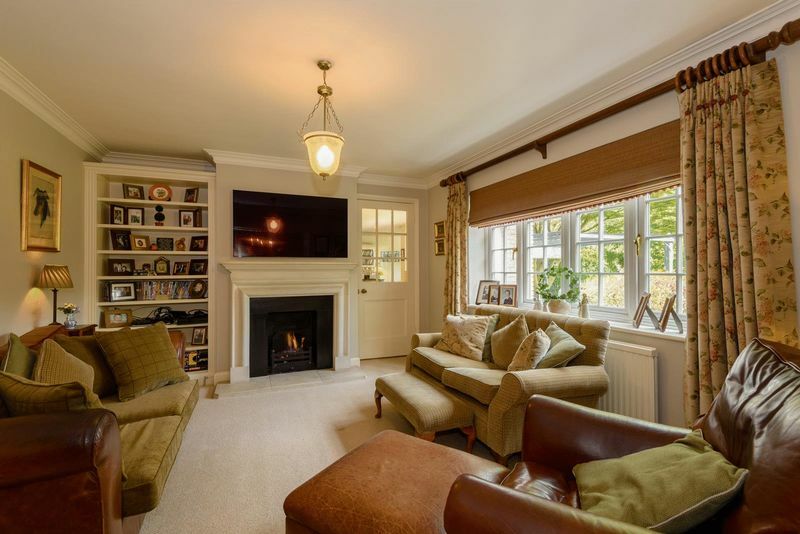 Bright spacious room with feature stone fireplace and tiled hearth, radiator, bespoke fitted units to one wall with shelves, space for TV. 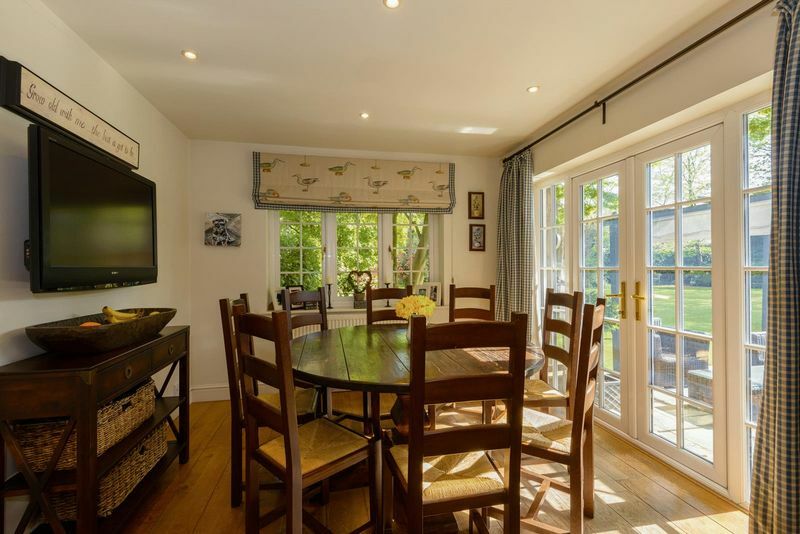 Window to front, two arched windows to side and french doors to rear with windows either side overlooking and leading to rear garden. 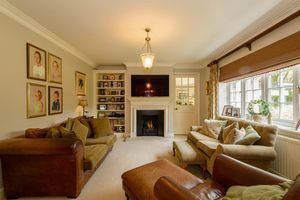 Feature stone fire surround and hearth, double radiator, large window to rear with views overlooking the rear garden. 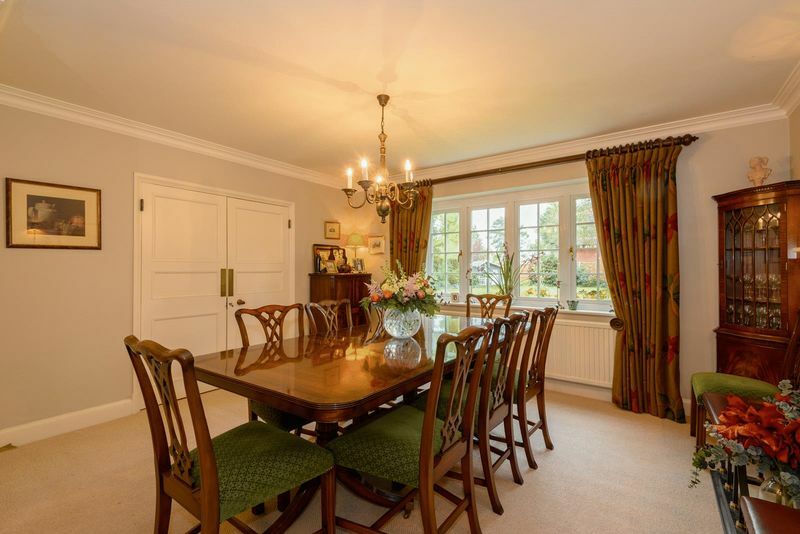 Accessed from the hallway with an additional half glazed door to the kitchen/breakfast room. 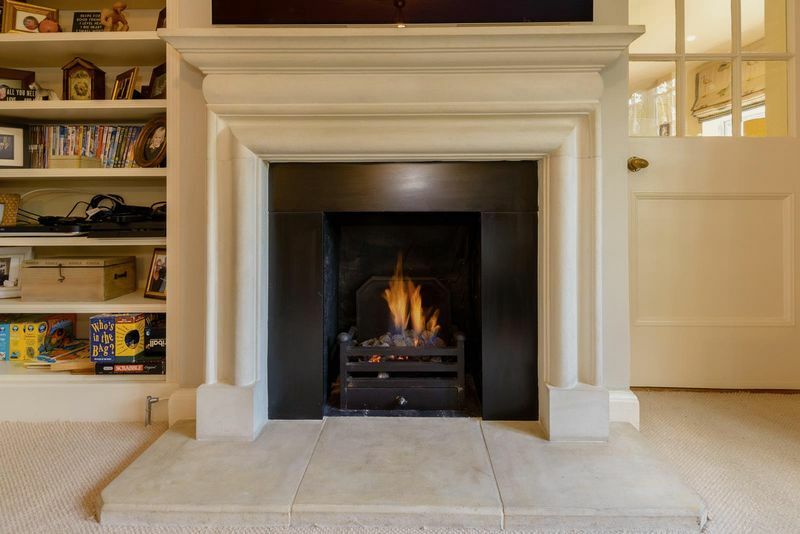 Feature stone surround with inset gas coal fire and fitted shelving to one side, window overlooking the rear garden. 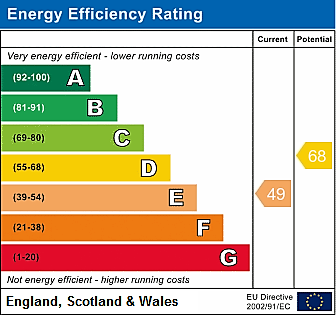 Fitted with shelving and cupboards across one wall, radiator, window to front. 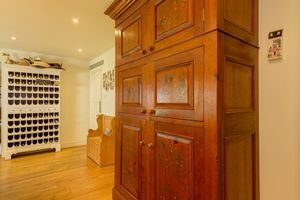 An extremely useful storage area with shelving to ceiling height and further cupboards with work surface. 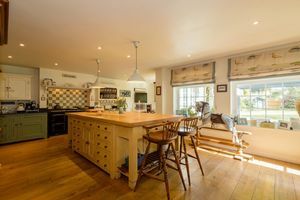 Work surfaces to two walls incorporating ceramic single drainer sink with mixer tap and storage cupboards below, space and plumbing for appliances including an American style fridge freezer, large deep storage cupboard with integral light, quarry tiled flooring, window to front and door to side. 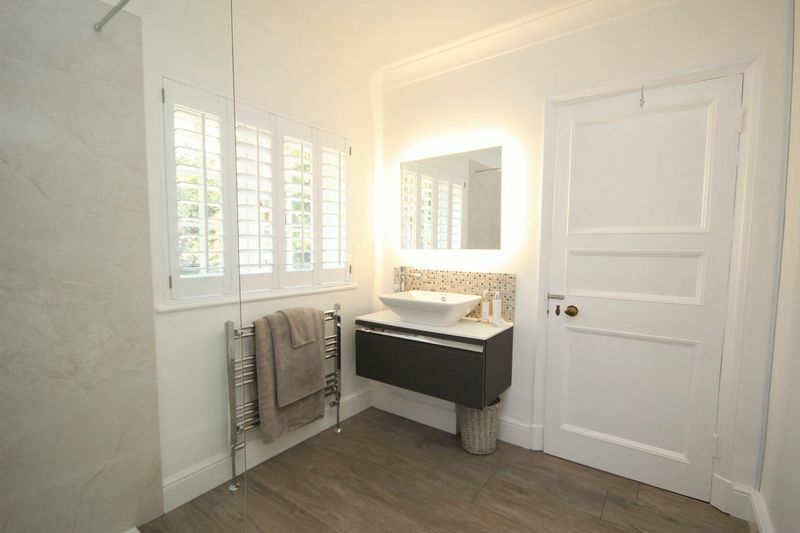 Close coupled WC, corner wash hand basin with storage below and ceramic tiled splash back, radiator, quarry tiled flooring, obscure window to side. Superb galleried landing measuring 31'8" in length, access to loft space, radiator, large airing cupboard with shelving and Gariston water heater, two windows above staircase and two windows to front. Fitted wardrobes across one wall with matching doors and drawers, radiator, Victorian style fireplace, wall mounted TV point, window to rear. 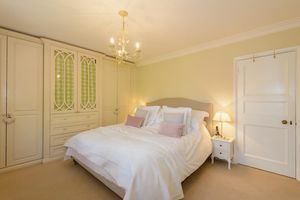 Hanging rails to two walls with matching shoe shelves. Fitted wardrobes and drawers to one wall, radiator, window to rear. 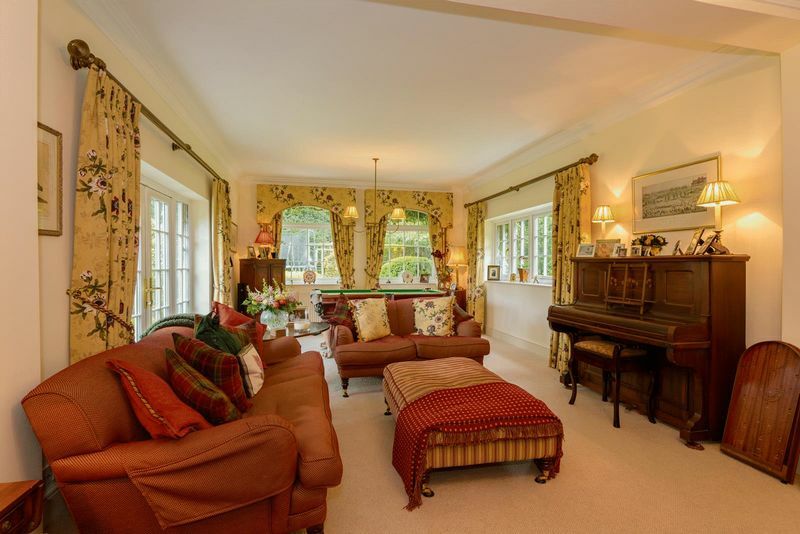 Radiator, windows to front and side. 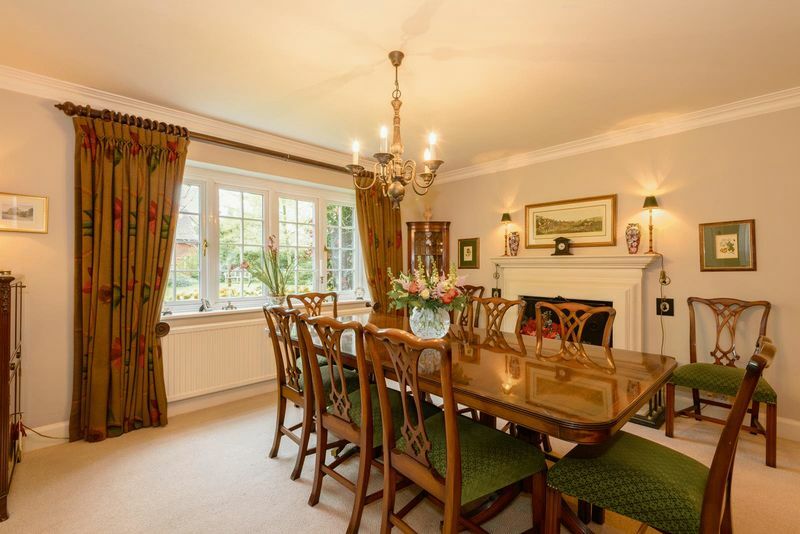 Two radiators, windows to front and side. 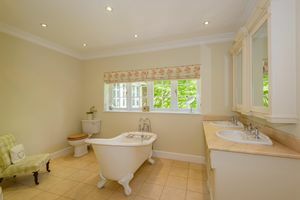 Luxurious and recently appointed with large walk in shower, close coupled w.c., vanity sink with storage, radiator, windows to front and side. 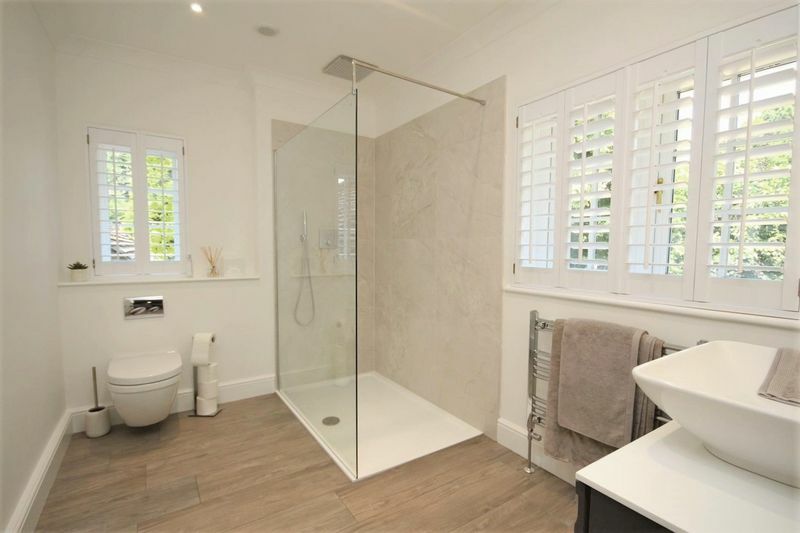 Free standing roll top bath with mixer tap and separate hand shower attachment, pedestal wash hand basin, close coupled WC, large tiled shower cubicle, chrome heated towel rail/radiator, shaver point, extractor fan, laminate flooring, obscure window to side. 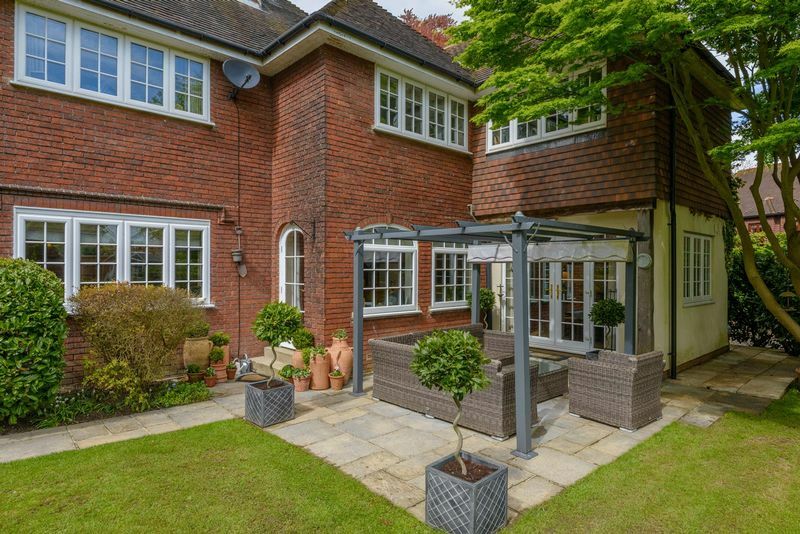 Windows to both sides, up and over door to front. 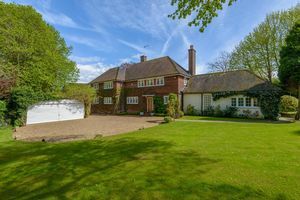 Double gates lead from Mill Hill to a large shingle driveway providing parking for numerous cars. 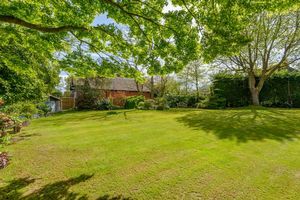 Rear gardens are south facing and are mainly laid to lawn with evergreen hedging to boundaries providing privacy and seclusion. 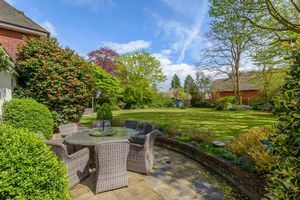 Variety of flower beds and shrub beds throughout the garden with terrace at the rear of the property provides an ideal outdoor dining area. 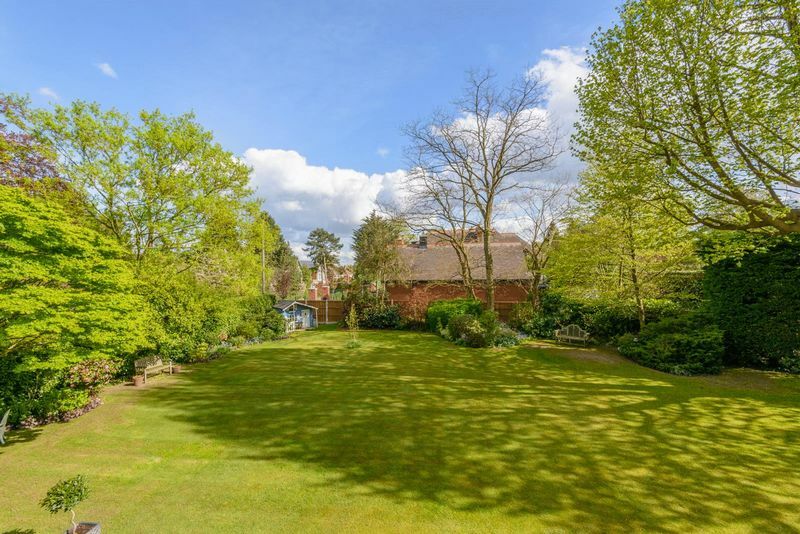 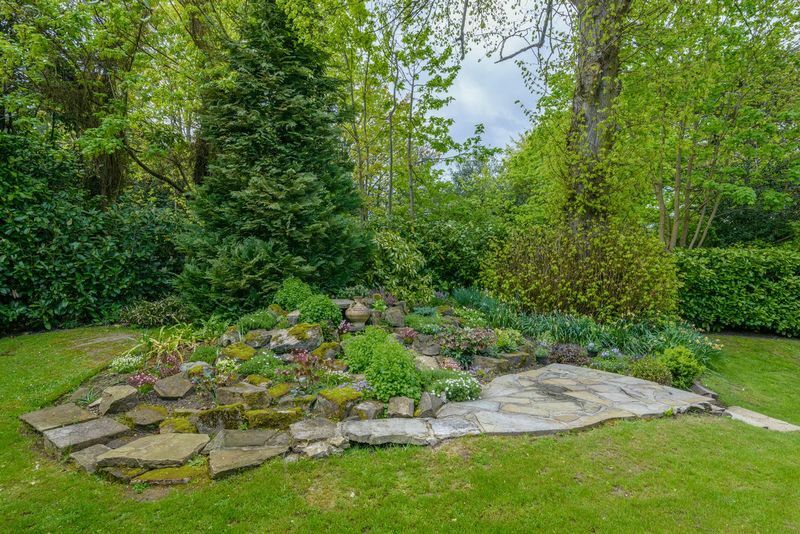 From this area a paved pathway runs across the rear of the house to a further terrace which leads to the west facing side garden which is mainly laid to lawn with shrub and tree borders, summerhouse to remain.